Raisins are a healthy food -- they are rich in carbohydrates with minimal fat -- but a diet that consists entirely of raisins isn't optimal for your health. Raisins do provide some vital nutrients, such as potassium, but there are many nutrients that raisins do not provide, including a number of vitamins. If you're trying to lose weight, an all-raisin diet can be particularly detrimental, as raisins are calorie-dense and full of sugar. It would be difficult to control your calorie intake on a raisin diet, as this fruit is calorie-dense. One cup of raisins provides 493 calories, or about 25 percent of the daily suggested intake of 2,000. This means you'd only eat four cups of raisin -- or less to lose weight -- each day. Such a small volume of food may leave you unsatisfied. Raisins are very low in dietary fat, with just .75 grams in each cup. So if you consume 2,000 calories worth of raisins, you'd end up getting only 3 grams of fat. This amount of fat is perilously low; the American Heart Association suggests eating between 50 and 70 grams of fat daily. Your body needs fat to produce hormones, provide energy and absorb certain vitamins. In addition to providing an inadequate amount of total fat, a raisin diet would deprive you of vital types of fat, including omega-3 fatty acids. Omega-3s are essential for healthy growth and development and optimal brain function. In addition, omega-3 fatty acids may help reduce your risk of cardiovascular disease. An all-raisin diet would be detrimental for weight loss and overall health due to the minimal amount of protein it would provide. Consuming 2,000 calories worth of raisins would provide just 20 grams of protein. According to the Institute of Medicine, you should eat at least .8 grams of protein per kilgrams of body weight each day. Thus, an 180-pound individual should eat 65 grams of protein or more each day. Your body needs protein to build and repair cells and tissues such as muscle. A study reported in July 2005 in "The American Journal of Clinical Nutrition" indicates that high-protein diets can be highly beneficial for losing weight because they suppress appetite and enhance calorie burning. 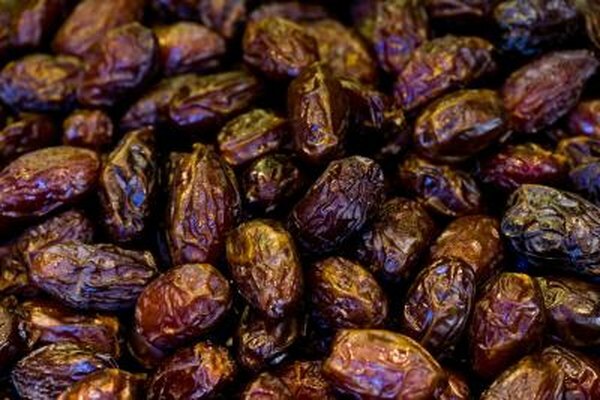 A raisin diet would be very high in carbohydrates; a 2,000-calorie raisin diet would provide 530 grams. Because your body uses carbohydrates as its primary source of energy, such a diet could be beneficial to athletes. However, too many carbohydrates can impair your weight management efforts. A study reported in the March 2011 edition of "Nutrition & Metabolism" found that an increased ratio of carbohydrates to protein promoted lower levels of muscle mass and increased fat storage. An all-raisin diet would be very high in sugar. Eating 2,000 calories worth of raisins would provide you with 396 grams of sugar. Too much sugar can promote tooth decay and obesity, so such a diet isn't ideal for dental health. A raisin diet would provide you with inadequate amounts of fiber. Women should consume at least 25 grams or more of fiber daily and men 38 grams. Consuming 2,000 calories worth of raisins provides just 24 grams of fiber, a nutrient that helps maintain the health of your digestive system, promotes satiety, and can help manage your cholesterol and blood sugar levels. Following a diet consisting entirely of raisins would compromise your overall health because it contains very few vital nutrients. Although raisins are rich in potassium, magnesium and calcium, they lack vitamins A, B-12, D and folic acid. Raisins are also quite low in zinc, vitamin C, pantothenic acid, betaine and vitamin E.
The American Journal of Clinical Nutrition: A High-Protein Diet Induces Sustained Reductions in Appetite, Ad Libitum Caloric Intake, and Body Weight Despite Compensatory Changes in Dirunal Plasma Leptin and Ghrelin Concentrations; D.S. Weigle et al.